Radical by David Platt is an audio book on CD. David Platt challenges listeners to consider how over time we have manipulated the Gospel to fit cultural preferences. The book examines and show listeners what Jesus actually said about being a disciple from looking closely at the original Gospel text. David Platt also tells the dramatic story of what is happening as a "successful" suburban church decides to get serious about the gospel according to Jesus. The book invites listeners to also join in a join in The Radical Experiment --a one-year journey in authentic discipleship that will transform the world you live in that needs to be reminded of the Good News Jesus came to bring. Running time = 6.5 Hours; Unabridged. 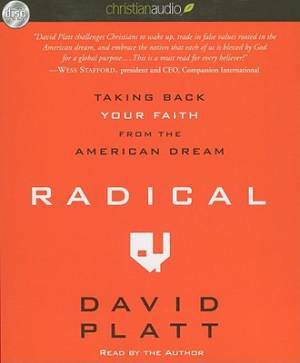 Radical - Audio Book on CD by David Platt was published by Hovel Audio in November 2010 and is our 27182nd best seller. The ISBN for Radical - Audio Book on CD is 9781596449381. Be the first to review Radical - Audio Book on CD! Got a question? No problem! Just click here to ask us about Radical - Audio Book on CD.